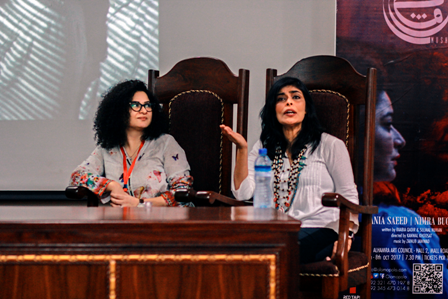 Forman Journalism Society (FJS) holds an interactive session with highly prominent celebrities of Pakistani entertainment industry: Sania Saeed and Nimra Bucha, on Wednesday 27 September. The session focused on the topic ‘The Role of Contemporary Media as a Tool for Social Change’. The speakers shed light on the use of various mediums of mass communication that could be used to drive a positive social change. The speakers articulated about an upcoming theatrical performance called ‘Mushk’, which carries the objective of making people aware of liberty & informed individual choices. 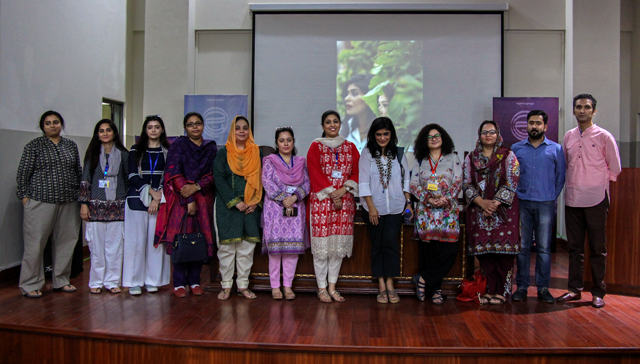 The event was attended by Chairperson of Mass Communications, Ms Rachel Hasan; Advisor FJS, Mr Syed Saqib Saleem; Lecturer, Ms Anam Muzammil; Lecturer, Ms Faiza Rafique; Lecturer, Ms Ambreen Javed; Lecturer, Ms Farheen Saeed; Lecturer, Ms Nida Tahseen and students from FCCU. The session turns out to be a great success, as people are given an opportunity to decipher complex societal issues, in regards to media with the help of the media experts available on the panel.